Considering the sort of gruelling election cycle that we've all recently played witness to, it's hard not to feel just a little bit jaded about the political process. After countless hours of negative attack ads from both sides, not to mention all the darkly metastatic talk about voter suppression, intimidation and other sinister works, real or imagined, it's hard not to wonder how things got quite so bad. Yet a cursory glance at pretty much any time in American political history - certainly any time over the last hundred and fifty years - reveals that it's always been this way. Candidates have always thrown lies and exaggerations around with gay abandon in the hope of smearing their opponent. Shadowy political cadres have always tried to keep people away from the polls using methods legal and otherwise, and politicians have used rhetoric to convince people that they know what is best for them, whether they actually did or not. Given this state of affairs, it's not surprising that the number of positive films about American politics can probably be listed on one hand, and even ones that might initially seem positive are actually, at heart, somewhat cynical. Mr. Smith Goes to Washington only seems uplifting because it spends most of its running time showing how Jimmy Stewart is literally the only good man in the whole of the District of Columbia. That he eventually triumphs over a broken system doesn't mean that the system isn't broken to begin with. Considering how bleak even the positive political films tend to be, it's no surprise that the ones that set out to dissect the dark underbelly of politics do so with an unblinking intensity that resonates years after they were made. Based on Robert Penn Warren's Pulitzer Prize-winning novel (which was itself inspired by the life and career of Louisiana Governor Huey Long), 1949's All The King's Men is one such example. It's told largely from the perspective of Jack Burden (John Ireland), a journalist who stumbles across the story of crusading, self-taught lawyer Willie Stark (Broderick Crawford), a man who rails against local corruption to seemingly no avail. After Stark is defeated by the local political machine, he quickly learns how to use their tricks against them and uses new found public anger over a preventable tragedy to advance his cause, in the process rising through the ranks of local politics, taking Burden along for the ride as his personal researcher/hatchet man. The basic story of All The King's Men is fairly familiar, being as it is one about how, in the words of Lord Acton, absolute power corrupts absolutely, but what marks it as a great film is the raw, unvarnished vision it offers of a man slowly losing his humanity. Stark never achieves absolute power, but his corruption is never in doubt. Even as he accrues relatively modest influence among the ordinary people, it becomes all too apparent that the compromises he makes in order to win - accepting donations from the very people he criticises - can't be made without destroying his soul. The process can be marked by the human debris that Stark leaves in his wake as he consumes, corrupts and destroys not only everyone who gets in his way, but even some of those who help him get his way. Although the story is Burden's, since he is the one who witnesses Stark's rise as his friend and employee, Broderick Crawford dominates the film as Stark. There's a wonderfully inscrutable quality to his performance that makes it hard to tell if Stark is a good man who went bad, or an inherently bad person who only showed his true colours once he was given the opportunity. There's a slight coldness to him even at his most fiery, constantly calling into question whether or not every action is genuine, or merely an act of calculation. No wonder that he won an Oscar for the role, or that the film won Best Picture on the back of it. 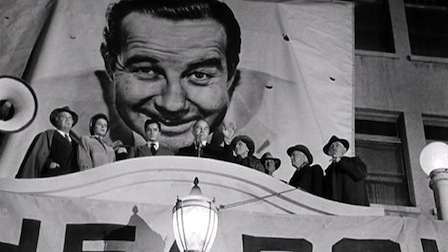 Even sixty-three years after it was released, All The King's Men remains a startlingly bleak examination of the workings of the political machine, how it takes people in and chews them out. What's more, it makes that point whilst also suggesting that Stark does some good for the people who elected him, amidst all his other, more destructive actions. It's both bombastic and nuanced, a surprisingly complex view of politics and the people who carry them out. It also remains oddly reassuring, too, since it stands as a reminder that politics might be a dirty business, but at least it's a consistent one.